I know I've been a bit of a stinker for posting recently and I'm sorry about that. Every time I see a mushroom on the lawn I think of you and want to grab my camera and tell you fairy stories... but life has a funny way of distracting me. My fairy mailbox broke. I've repaired it once already but the damned thing just falls apart every time there's a breeze. It could be the barrage of rain we've had, but I think it's probably the goblins who are sad no one ever sends them notes. Our raspberry plants are just about to ripen. We have to keep a close eye on them because the birds will gladly feast on them and leave us nothing at all if we don't get out there quick enough. 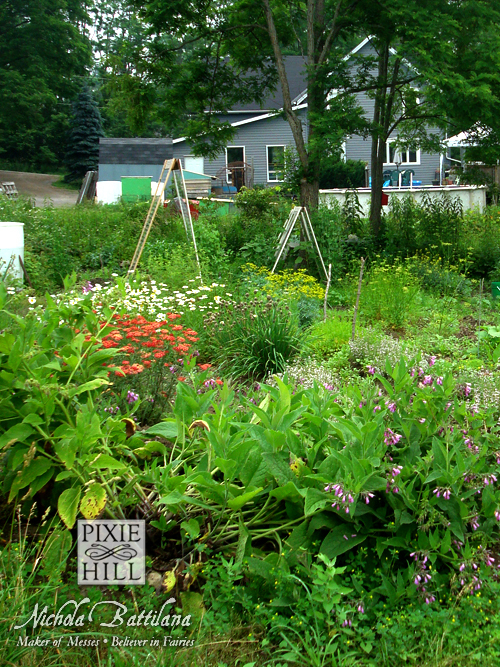 The pretty weeds are blooming nicely. 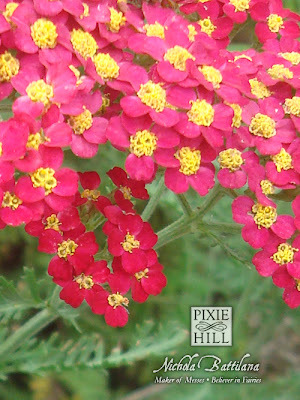 I love yarrow... especially this hot pink one. The comfrey is blooming to. 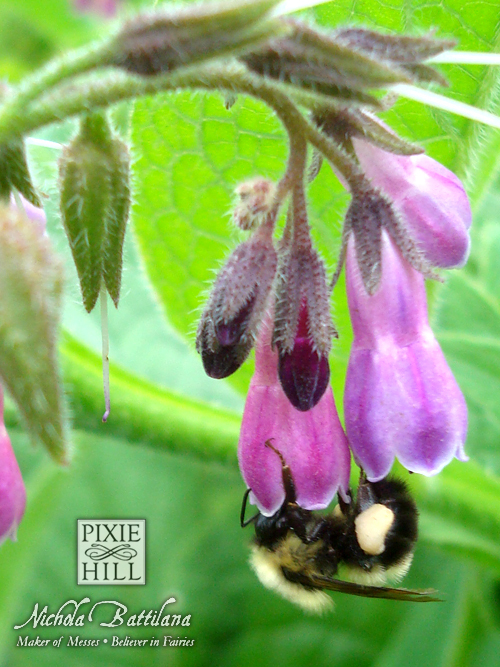 Bees LOVE comfrey and the plant is forever literally buzzing with activity. 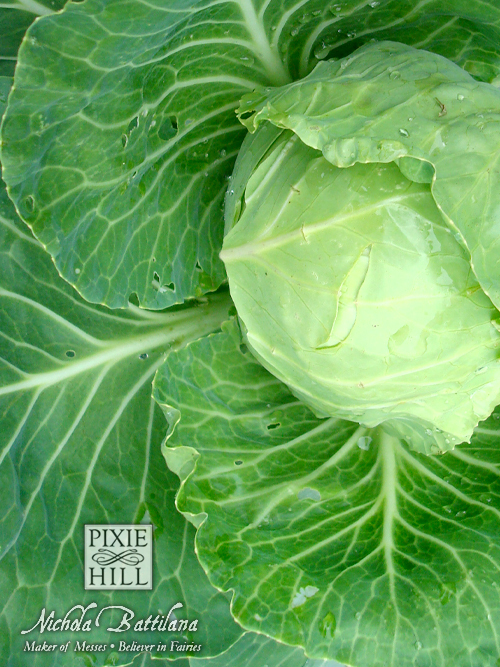 The veggies seem to be growing well this year. Just look at that lush cabbage! 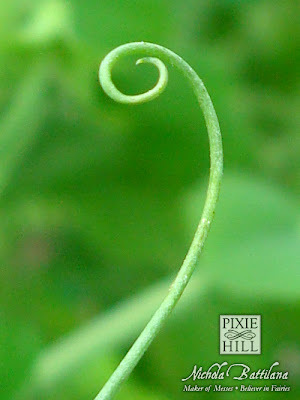 And that sweet little curly tendril! We've never had luck with peas but we had a feast last night and there's plenty left on the vine. 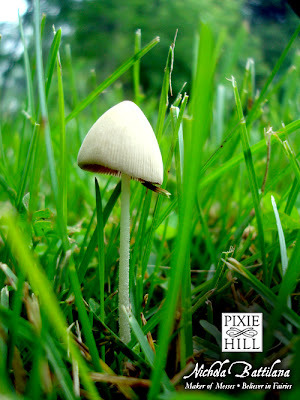 Loads of these little mushrooms have been popping up all over the yard this year. 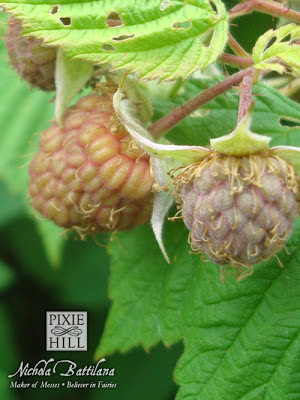 They are very sweet looking little things. I just love that long spindly stem with the great huge mushroomed dome. And here the whole garden looks quite pretty. The constant rains are causing things to bolt quickly and become overgrown as soon as you blink. I like jumbled chaos, the husband prefers neat and tidy rows. Neither one of us is fond of the terrible gangs of mozzies waiting to attack at all times. The garden looks fabulous! Great photos..that shot of the comfrey is so delightful! 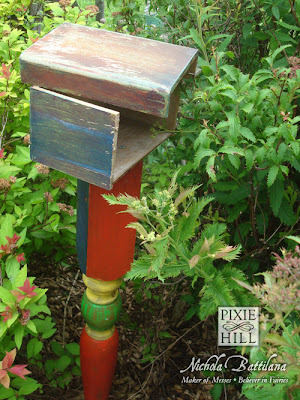 Happy summer...you have your own wonderland there to enjoy! 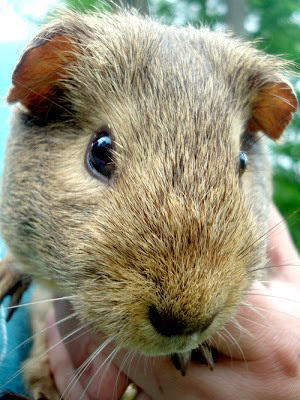 I love the guinea pigs, too cute! It's all lovely, Nichola. 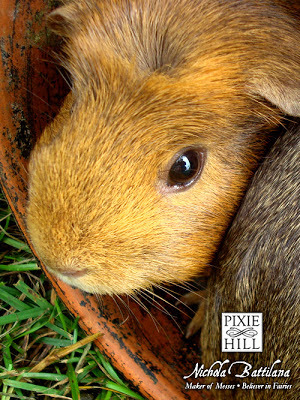 We used to have Guineas too! One was a wire haired - dark chocolate and we called him Raisin. I love the wee babies they have. Our guineas loved cucumber peels. Whenever we opened the fridge door, they started churring because they were hoping for cucumbers! What fun they were. Your garden looks lovely! 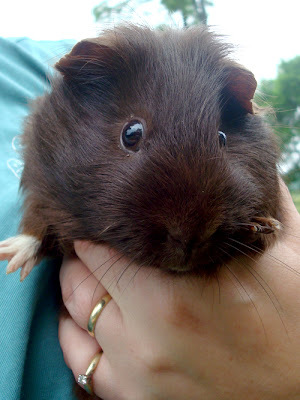 Guinea pigs are the best, aren't they? Fantastic garden! Sweet G.pigs. We had an author bring a naked G.Pig to the library this Spring. All the children were in awe.